In early 2012, I wanted to go on a relatively short, unsupported cycling trip on my own. In August 2012, it became a reality. This was intended to be a confidence builder/shakedown trip since I hadn’t really done more than about 30 miles unsupported before and wanted to see what I could do. I ended up going about 320 miles in a week (with a day off in the middle). This is not really ambitious but ambition wasn’t the goal. I planned my trip to be “North and/or Northwest”, but without a final destination. I had never done this kind of thing before, and wasn’t sure what to expect. Really, it was a sort of dry run for perhaps a longer trip if I discovered that I enjoyed myself and didn’t encounter any disasters or showstoppers. In the past 5 years, I’ve done about 4000 miles of cycling around home, comprising supported club rides (up to 100 miles a day for the MS150) and unsupported loop rides by myself, up to about 50 miles round trip. I didn’t have a specific finish line in mind, but determined that if I made it past 100 miles and 2 nights that it was a success. Anything after that was additional accomplishment/bragging rights. I have sleep apnea and need electricity overnight. All nights would be hotels. No tent, sleeping bag or camping gear (even as backup). Mission success was reaching Navasota by day 2. I tentatively targetted Memphis, TN as “final” destination. If I did that really well (ha ha), then I would proceed further north. I had no idea how I would get home (trip completion, emergency or otherwise), or where I was going to end up. Travel choices for the return trip seemed to be (1) ride back, (2) rent a car one way (3) Amtrak or bus (4) benevolence of friends (5) drop/sell the bike and fly back. 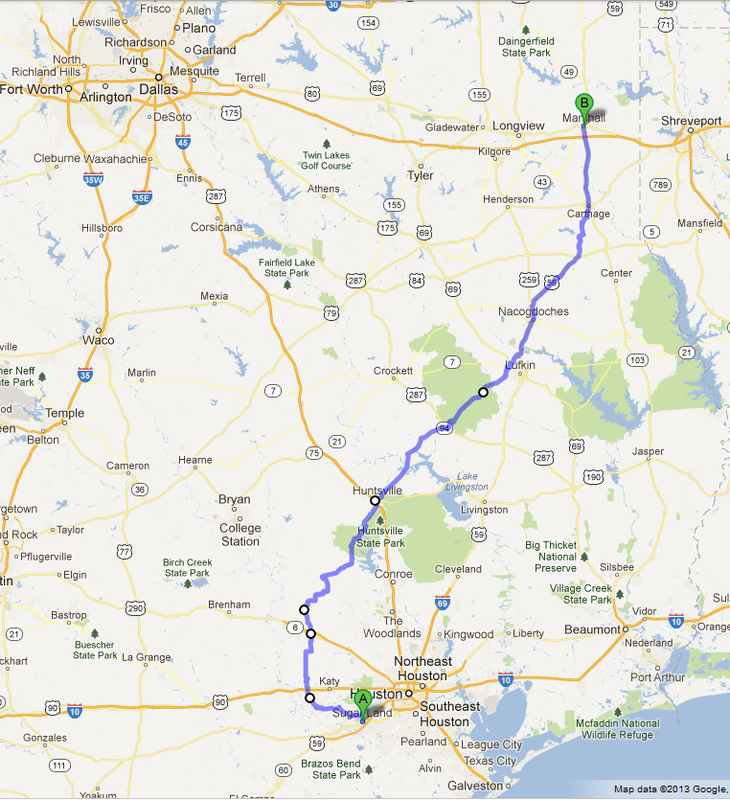 I planned on staying the first night in a hotel in Brookshire, 35 miles away. I’d stayed here twice before, connecting with organized club rides out of Brookshire (the organized part of the past ride started in Brookshire; I rode up there myself (35 miles) and stayed in a hotel before/after the organized part). I had subsequent overnight spots picked out as contingencies and would select the next one based on how much mileage I could accomplish each day. Planned daily travel: 20 to 60 miles a day, primarily determined by hotel location. I have read from other people’s blogs that a reasonable day (excluding all the extreme trips and super-fit athletes) on a multi-day trip is 35 to 65 miles per day. I am not an athlete by any measure and not in the greatest shape. I set my sights lower right to start off with. If I did better than expected, I could revise upwards (this is much easier than overestimating and revising downward).